Rep. Gabriella Giffords was murdered shot today at a public event in Arizona. [Corrected: earlier reports stated the congresswoman had died, but she is now said to be in critical condition.] At least a dozen others were also injured by the gunman. Our prayers to all those affected by this tragedy. Or perhaps someone took inspiration from all the "assisinate George Bush" talk a few years ago. Do you know the motiviation of the shooter? I don't -- and I live in Tucson. For all we know it was some left-winger who was disappointed with Gifford's insufficiently liberal stance. I once spent a flight from Chicago to Tucson sitting next to Giffords. I don't agree with her politics at all. She seemed a gracious woman and despite our differences I bought her a drink and we had a pleasant enough 3 hour flight. When I first heart this on the radio I was a few short miles south of where the shooting took place. My first thought was for Giffords and the others. I chose not to make political hay out of this. And I condemn anyone who does try to make political hay out of. So ... knock it off, Scanlon. No there is much information about Loughner who did the shooting (I believe that there are reports that there were others involved, but nothing firm yet). If you go to the Loughner's YouTube site, one can tell a little about this nut ball. His favorite books include the Communist Manifesto (another Lee Harvey Oswald?) as well as Animal Farm and Farenheit 451. My take on his video on you tube - left winged nutball. If I were moderator of this forum, I would put you in my crosshairs and take you out as a commenter. I'm all for the free exchange of ideas, but you consistently do little else than troll with stupid comments like this. Better to let the various points of information to come together before making judgments about the motivation or the politics of this. Plus, if you start labeling this the act of a "left-wing nutball" and seek to paint all liberalism with this, you can rest assured the same will take place in spades when some "right-wing nutball" does something similar. Ugh, you are such a . . . I can't believe you use an assassination attempt in which at least five people are killed for your sophomoric and idiotic partisan shots. Don in AZ said: "Plus, if you start labeling this the act of a 'left-wing nutball' and seek to paint all liberalism with this ..."
And precisely where did you find this "seeking" in the post you were replying to? cowgirl wrote: "My take on his video on you tube - left winged nutball." I admit that's something far short of painting with a broad brush all liberalism with the actions of this shooter. Perhaps I should have used a different pronoun from "you" in that sentence. That implies I was referring to cowgirl herself. I didn't intend that. "Plus, if people start labeling this the act of a "left-wing nutball" and seek to paint all liberalism with this ..." ?? "Plus, if others start labeling this the act of a "left-wing nutball" and seek to paint all liberalism with this ..." ?? What would be the best way to phrase what I was trying to get across? Honestly, what's the proper grammar there? His list of preferred books included Mein Kampf, Too Kill a Mockingbird, and The Wizard of Oz. I would not draw too many conclusions from the book list. The man's thinking appears at first impression to be an incoherent jumble. Look, when someone uses "Don't Retreat, Instead - RELOAD!" and other militaristic political rhetoric and symbols that include targets, don't be surprised if people remember that and suggest that such things could have served as some sort of awful, triggering inspiration. Surely, some self-styled "principled conservatives" are now nodding their heads solemnly and seeing this as a tragically inevitable "Second Amendment solution" in response to a Democratic attempt at tyranny - since, after all, Democrat = liberal = evil = leftist = socialist = communist = fascist = terrorist (etc., etc., etc.). It's not as if we heard a peep from anyone here when Byron William went on that shooting spree in Cali., and admitting that he's received his primary home education from honored Ashbrook speaker Glenn Beck. 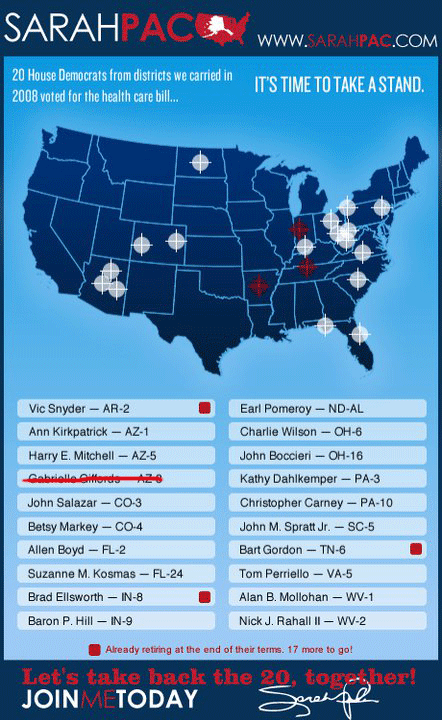 And it's not as if Giffords hadn't received numerous threats before this happened, including someone dropping a gun (Oops!) at one of her town hall meetings. "I hope you die in a fire you America-hating freak." "In 2009, Judge Roll faced death threats after presiding over a $32 million civil-rights lawsuit. The lawsuit was filed by illegal immigrants against an Arizona rancher. After Judge Roll ruled that the case would be certified, threats came from talk-radio shows which fueled controversy and spurred audiences into making threats against the judge. After one radio talk show, Judge Roll's name logged more than 200 phone calls as some callers threatened the judge and his family. This resulted in the judge and his wife being placed under a full-time protective detail for one month. A US Attorney's investigation identified four men as the makers of the threats, but no charges were filed. In a July 9, 2009 interview with the Arizona Republic, Judge Roll described the time under high security as "unnerving and invasive. . . . By its nature it has to be," Roll said." As it stands though, I think the shooter was simply schizophrenic and had no coherent thinking. He could've shot just about any VIP. Likely true. Or a nine year old girl. I'm not sure you really want to get into a competition of "which end of the ideological spectrum uses the language of violence and death more than the other." The left certainly has its share of very well known participants in that. 1) I lived in D.C. during the "sniper" incident. Weird, freaky time that was. The informed class conclusion (read, "Washington Post") had it pegged as a white right-winger. That it turned out to be a black Muslim made things more difficult for the Post. Similar things may happen here. 2) The rush to demonstrate more shock and grief than the next is something that makes me uncomfortable. Particularly when people compete for face time to express that grief to as many people as they can. The newspapers are full of pictures of candlelight vigils, cards stacked up against walls and the like. It reminds me of what took place after Princess Diana died. The excess of public and publicized wailing there was downright ... astonishing. "I'm not sure you really want to get into a competition of "which end of the ideological spectrum uses the language of violence and death more than the other." Actually, I wouldn't necessarily shy away from such a thing. There's a reason why GOP-conserva-teapartiers so commonly toss out "peacenik" as though it's the ultimate insult. Bizarre coincidence about that 9-year-old girl that was killed - I read that she was born on 9/11/01. You may dismiss the author of the blog if you'd like. What is shown are actual pictures of the kind of "Bush = Hitler" imagery that prevailed during his eight years in office. Again, dismissal of the messenger does not refute the message. Of course the next strategy is to make a false equivalency argument -- "Palin is a former VP candidate, not just random nobodies in a crowd." 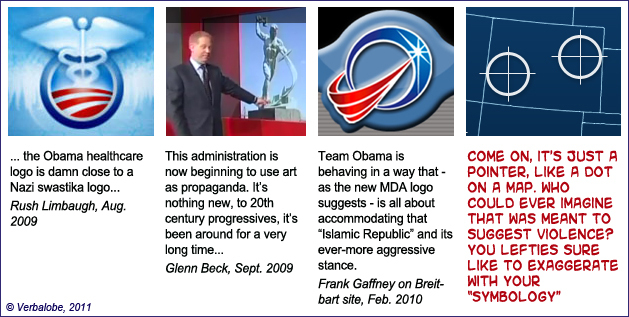 Which shows the use of targets and targeting language by Democrats against Republicans. But from there the "debate" would devolve further into nit-picking about specific words, specific people, specific intent. That's right ... the whole "Bush = Hitler" thing never occurred. Nor did all the talk about killing him. Nor did a movie that portrayed his assassination. Nor did Democrats ever speak of or write of "targeting" Republican office holders. o First, you'll seek to dismiss whatever website I offer as being invalid or biased, regardless of the validity of the message offered. The implication is that whatever you offer, however, is always valid. o Then you'll start drawing distinctions between who you cite as saying something on the Republican side vs. what I cite as who says something on the Democrat side. For instance, you'll start making claims that words coming out of Sarah Palin's mouth two years after she was the VP candidate are somehow of more significance than, say, some prominent Hollywood celebrity with a large audience mouthing off. o You'll elevate people like Beck and Limbaugh to levels of influence and control that simply do not exist, and you'll dismiss any assertion that anchors on CBS, NBC, ABC, CNN, MSNBC have considerable influence themselves. o You'll drag into the equation some extreme comment by a fringe nut-job on the right, but will reject any offering of more mainstream lefties like Maher or Whoopie Goldberg. So no, I won't even bother engaging you in an inventory of who said what and when. It's a fruitless exercise. And, I suspect, you are at this moment simmering in a rather self-righteous sense of superiority over me because you have thrown down the gauntlet but I have refused to pick it up. Just giving Scanlon the other side of the story. One could always thrown in the list of left-wing nutballs like Bill Ayers, The Black Panthers, The Underground Weatherman, Squeaky Frome, Hinkley, etc who all seem to have a lot in common with this guy - all left-wing nutballs. Just wanted to get Scanlon to think a bit. One other tactic -- when the argument isn't on your side, you simply cease your side of the conversation. Then you appear in another thread and start the process over again. Let us not forget Jesse Jackson who is an anti-Seminite and support communist Dictators like Charles Johnson, or better yet the REVEREND Al Shartpon who incited a riot that led to the murder of a Jewish man. "And, I suspect, you are at this moment simmering in a rather self-righteous sense of superiority over me because you have thrown down the gauntlet but I have refused to pick it up." "Actually, I wouldn't necessarily shy away from such a thing." That's it. That's all I said on the matter. And you think that I have "thrown down the gauntlet"?? That's not a very plausible interpretation of my words, Don. But it's always interesting to be told what I think, how I feel, and what I would do in a given hypothetical situation. "One other tactic -- when the argument isn't on your side, you simply cease your side of the conversation." How can you accuse me of running away from an argument that you've preemptively refused to engage in? Oh, but I have not preemptively refused to engage. You preemptively resigned. Can we please just cut this stuff out now? "Oh, but I have not preemptively refused to engage. You preemptively resigned." "So no, I won't even bother engaging you in an inventory of who said what and when. It's a fruitless exercise." You have been rather dishonest here, to put it mildly. Craig, what is politics to you? Why is engaging in political discourse a meaningful activity? On the contrary, it is you that is being dishonest. that is clear by the very post in which you accuse me of being dishonest! Don, I'm sorry to say so, but you seem to have a serious problem with reading comprehension.